Since the beginning of recorded history, humans have noted the cyclic patterns of nature, celebrating them with elaborate festivals and using them in their daily lives to keep track of time, to time planting and harvesting of crops, and to guide them on their travels. The equinoxes and solstices were major events in many cultures, with other festival related to the growing seasons and agricultural lives of the villagers celebrated in between. These annual events were the heartbeat of the community and helped describe its role in Nature as it interacted with the plants and creatures within the larger ecosystem. We make available our Seasonal Cycle Cards as cards and as images in a simple Scratch coding program that cycles through the seasons. We use images of the seasons and images of celebrations of the annual solar and agricultural cycles, in Scratch, a very easy to use kid’s programming tool with drag and drop coding method. Of course you can also paint or draw the images with crayons without Scratch. 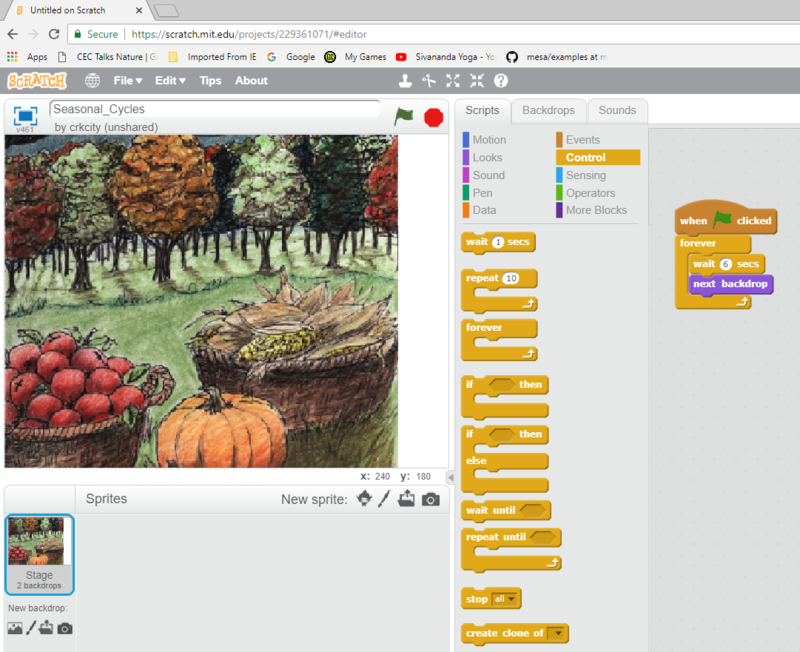 If you like, you can take a photo of your drawings and upload them to your Scratch project. Our Seasonal Cycle Cards are richly illustrated with images representing some of the various celebrations of the annual solar and agricultural cycles. On the back of each card, there is a brief description of the festivals pertaining to the period of the solar cycle. These cards can be used to teach about annual solar patterns (equinox & solstice), illustrate annual growing cycles (planting & harvesting), explore agricultural customs of various cultures (ancient & modern), and serve as the focal point for meditations on Nature and for your household’s seasonal celebrations. KJ Keane of New Moon Studios and Flock Ecogames created these cards and also seasonal cycle greeting cards.